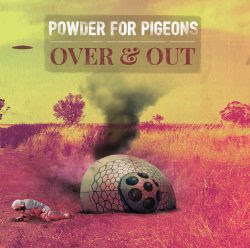 Today POWDER FOR PIGEONS are celebrating the release of their album “Over & Out”, which is now available both as ‘Marbled Mud’ vinyl and digitally with seven powerful songs right on time for the start of the same-named European tour. 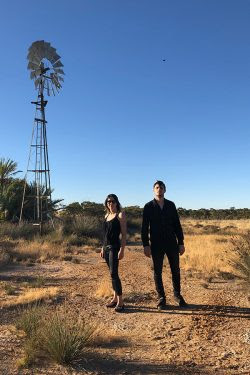 The duo from the dusty outback of Western Australia continues their successful DIY path with their gigantic Alternative Rock, Stoner and Grunge mixture. “Over & Out” is about the controversial times we live in, with observations and passing sarcasm touching on topics such as the internet, social media and what comes with it. The overflow of information and endless opportunities influence our way of thinking and our actions in our daily lives while constantly opening up new situations and unpredictable changes we have to deal with. Things are moving so fast nowadays, that it’s hard to keep up. In order to move with the times, we have to be able to change and mould with new situations. As safe as we feel in one moment the next can catapult us out of our bubble and into the opposite extreme with uncalculated outcomes. As depicted on the album cover, however advanced we are, one can easily make a wrong turn to crash and burn. Rhys, who already supported Rock giants such as Status Quo and Deep Purple with his former Australian band, and the native German Meike Jones, who previously had a deal as a studio drummer with Rainy Day Records, a subsidiary of the legendary Sound City Studios in Van Nuys (Los Angeles), have built a steadily growing fanbase in over ten countries with their authentic, raw and dirty power. The couple has already toured with Monster Magnet and shared stages on their road trip between the two continents with bands like Soulfly, Sepultura, Melvins, Clutch and Fu Manchu, just to name a few. After having played festivals such as Czad Festiwal (PL), Vestrock (NL), Öllesummer (EST), Freak Valley (D), Up in Smoke (CH), Stoned from the Underground (D), Desertfest, Roadkill (B), Poolbar Festival (AT), Volcano Sessions (FR) among many others, POWDER FOR PIGEONS emphasize their status as one of the most exciting new acts on the scene!